If your iPhone, iPad or iPod touch runs iOS 11.2.5 or later, Siri in hands-free mode can read out the news to you. You can even ask your smart digital assistant to read aloud news stories limited to specific domains, such as sports, business or music, here’s how. This feature, called Siri News, was designed for hands-free situations where you’re not looking at the screen. 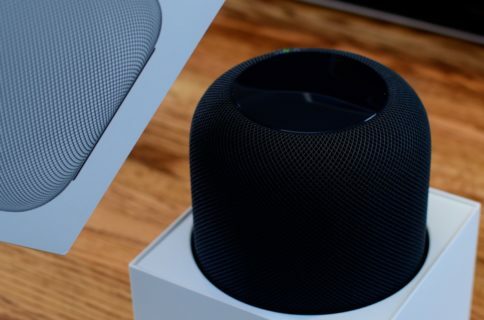 It can only be used when Siri is invoked via the familiar “Hey Siri” hot phrase, CarPlay or headphones, not when waking her manually by holding the Home or Side button. Siri News is officially available in the US, UK and Australia. If you live in an unsupported country you may still use this feature, but content will only be provided in English. The command is shorthand to play a relevant news podcast. If you don’t have the Podcasts app installed on the device, Siri will fall back to playing whatever you were last listening to. 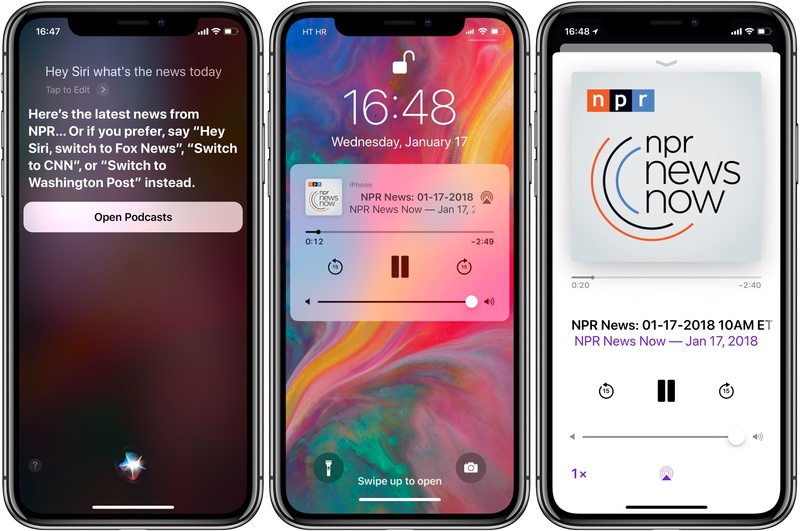 Siri will play your news podcast in the background so you can continue using your device. If you’d like to jump directly to the podcast, tap the Open Podcast button found on the Siri results screen or use the iOS app switcher to bring the Podcast app to the foreground. 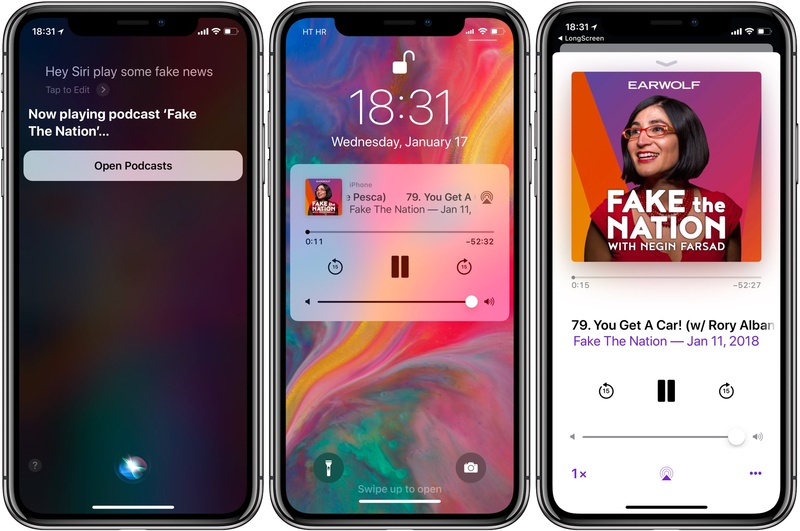 Alternatively, touch the podcast title on iOS’s playback controls available from the Lock screen or Control Center’s Music widget to show the currently playing news show in the Podcasts app. Asking Siri about the news of the day provides generic updates. If you’d like to be more specific, you can ask her to read aloud news from one of the supported sources, like “Hey Siri, play some news from The Washington Post” or some such. As mentioned, you can also ask for business, sports or music news. As a nice touch, asking Siri to play some fake news will launch Earwolf’s “Fake the Nation” news podcast with Negin Farsad. Defaults differ from one country to another so your mileage may vary. For instance, customers in the UK will notice that Siri automatically offers up local audio news from BBC, Sky News or LBC. Again, Siri News is only available when using “Hey Siri” or asking the assistant about your local news of the day in hands-free mode, while using CarPlay or headphones. Requesting news after invoking Siri manually will bring up textual news headlines from Apple News or third-party web sources if Apple News is unavailable or not installed on the device.